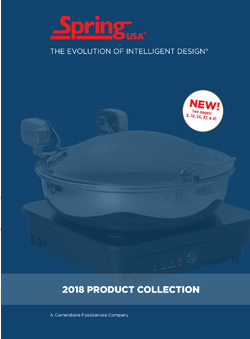 With our exclusive design, superior quality, impeccable workmanship & unique detail, our Breakfast Collection meets the demands of the world's top professionals. Our Renaissance Urns exhibit the utmost in exclusive design, unique detail and superior quality. Constructed from mirror-polished 18/10 stainless steel. Part of the Spring USA Breakfast Collection. Legs and faucets are solid cast stainless steel, not brass. Part of our Breakfast Collection ~ Our Renaissance Urns are our exclusive design, with their unique detail and superior quality. Constructed from mirror-polished, 18/10 stainless steel. Legs and faucets are solid cast stainless steel, not brass. Coffee urns are NSF approved. 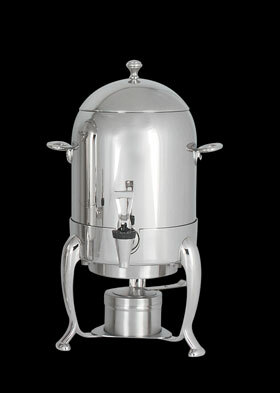 Complete the look ~ The Coffee Urn compliments the Spring USA line of Renaissance Chafing Dishes! Going Green? 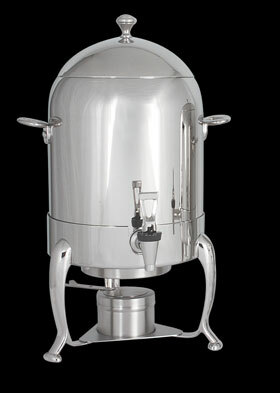 Coffee Urn can be used with an Electric Heating Element ~ See Item #9503. 18/10 Mirror-polished stainless steel, featuring a solid cast stainless steel faucet, not brass – like others. Coffee Urn can be used with an Electric Heating Element, Item #9503 ~ Purchase the heating element and do away with the use of canned fuel! Save your facility some $$$! 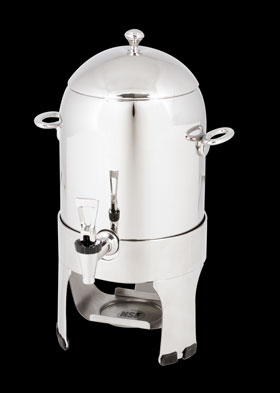 Coffee urns are NSF approved! Legs have skid & scratch-resistant footing. Fuel holder is included. Faucets on this unit can be purchased separately as well. See Item #505-12S.